Okko Kamu was born in 1946 into a musical family in Helsinki, where his father played double bass in the Helsinki Philharmonic. At the age of two, Kamu started studying the violin with Väinö Arjava, the leader of the orchestra. In 1952, he continued with Onni Suhonen at the Sibelius Academy, where he also began studies on the piano. He became the leader of the Suhonen Quartet in 1964. 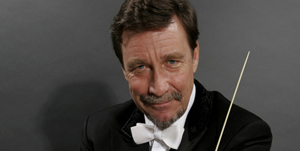 In 1965, Kamu started his professional career in the Helsinki Philharmonic, and in 1966 was elected to become Concertmaster of the Finnish National Opera orchestra. In 1967, the National Opera offered him the post of third conductor, with responsibilities including ballets, operettas and his own production of Britten's The Turn of the Screw. In 1969, he accepted the position of guest conductor of the Swedish Royal Opera in Stockholm and later that year won first prize in the first International Karajan Conducting Competition in Berlin, which led to an extensive international career. Okko Kamu went on to hold the position of Chief Conductor of the Finnish Radio Symphony Orchestra (1970-1977), the Oslo Philharmonic (1975-1979), the Helsinki Philharmonic (1981-1988), the Helsingborg Symphony Orchestra (1990-1999), and the Finnish National Opera (1996-1999). He was also Principal Guest Conductor of the City of Birmingham Symphony Orchestra and the Copenhagen Philharmonic. Having conducted the leading orchestras around the world, including the Berlin and the Vienna Philharmonic, and in the US the Chicago and the Los Angeles Symphony Orchestras, Okko Kamu currently holds the position of Principal Guest Conductor of the Singapore Symphony Orchestra since 1995. He has also been a member of the Swedish Royal Music Academy since 1994.